The 49ers continue to express interest in Iowa tight ends. Their current one has worked out. George Kittle, a fifth-round pick in 2017, set the single-season tight-end yardage record by compiling 1,377 receiving yards in 2018. He was named a second-team All-Pro. 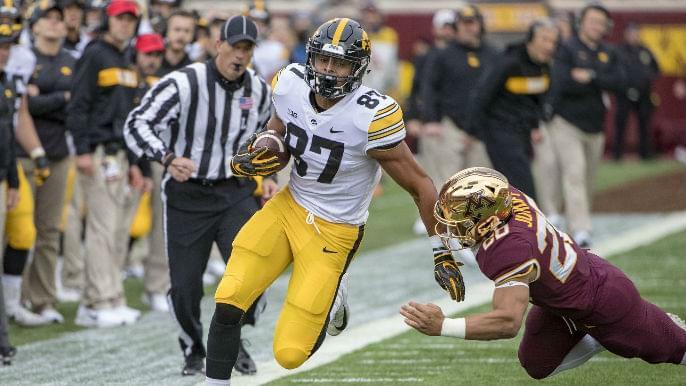 The 49ers will reportedly meet with Iowa prospect Noah Fant this week, as first reported by Alex Marvez, ahead of the 2019 draft later this month. NBC Sports Bay Area’s Matt Maiocco confirmed the news. Fant is considered the second-best tight end prospect of this year’s draft class behind college teammate T.J. Hockenson. While Hockenson is viewed as the more polished prospect, Fant’s upside is undeniable. At February’s NFL Combine, Fant ran a 4.50 40-yard dash, which led all tight ends. His 6.81 three cone time and 127-inch broad jump also led the position group. According to various mocks, Fant is unlikely to drop to the 49ers’ No. 36 overall pick, their second of the draft. He is projected as mid-to-late first rounder. If the 49ers trade down and acquire a late first-round pick, they could potentially have access to Fant. Adding another tremendous athlete at the tight end position would supplement the 49ers offense. The 49ers need greater production from their second tight end. Last year, Garrett Celek contributed just five catches for 90 yards in 15 games. Kyle Shanahan has built the current 49ers offense from the inside-out, stockpiling dynamic running backs and featuring Kittle. Drafting Fant would continue that line of thinking.